read moreThe Sky Their Battlefield II is available through Cross & Cockade International for £40.00 (softback) or £50.00 (hardback) plus postage. read moreThe 2016 Cross & Cockade International calendar is here! 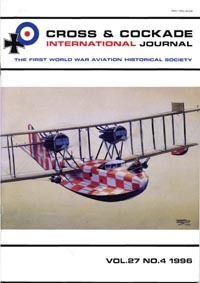 read moreReaders of aviation magazines this month will have been pleasantly surprised to read that Peter Jackson's New Zealand based operation, TVAL, has recently flown a replica DH4 in USAS colours. read moreWe have a report from our President, Peter Dye, who states that the British Air Services Memorial is in good shape - 10 years after it was first erected. read moreThis new book, The Sky Their Battlefield II, is available through Cross & Cockade International for £40.00 (softback) or £50.00 (hardback) plus postage. read moreGordon Atkins' acclaimed biography of Victor Yeates, "Winged Victor" has been out of print for some little while. We're delighted to announce that the biog of the author of classic WW1 aviation "novel" (almost an autobiography ...) "Winged Victory" is now available as a PDF download from Cross & Cockade International. The society regularly receives gifts and bequests, which often include members' book collections. We are hugely grateful to members for these generous gifts and, to make the most of them, we have a section of the web shop where they are available for sale. read moreWe've heard today from family history web site FindMyPast, that they are now offering searches and downloads on The National Archives digital archive of officers and other ranks personnel records, known to us as AIR76 and AIR79. 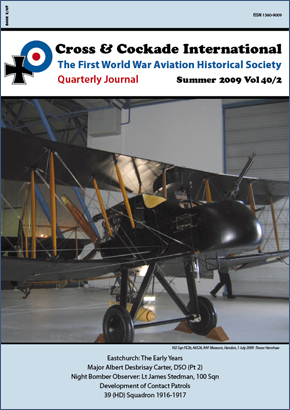 read moreAll back issue stock to Volumes 34 has been donated to the RAF Museum, who have offered to take responsibility for the stock and sell it through their shops at Hendon and Cosford. read moreThe Heartbleed Bug has been widely reported around the media over the past few days. It is a real threat. However, we're delighted to say that our site is not affected, as we do not use the Apache web server technology. read moreA selection of First World War footage from Pathe News, covering the Royal Air Force, British, French and American airmen, zeppelins, balloons, plane wrecks and the Royal Navy Air Service. read moreWe have an exclusive new book for sale in our shop: "Storia del Campo di Volo di Villaverla". read moreWe thought he was a figment of WE Johns' imagination - looks like not! read moreIn November 2012, The Western Front Association announced the acquisition of some 6.5 million Pension Records Index Cards and Ledgers (PRCs). We are sad to have to announce the death of George Miller. Rumours have been flying for some weeks, that Essex WW1 home defence airfield Stow Maries is up for sale. Bob Gardner is the leading expert on propeller design and manufacture in WW1. Over the past few years, Bob has been bringing out a series of books on British propellers and menufacturers, which, when complete, will doubtless be the definitive word. These books are now available through the society's web shop. Cross and Cockade International hosted a highly successful seminar over the weekend of 22nd to 24th June 2012. Never mind the Olympics - THIS was THE unmissable event of 2012 - for anyone interested in WW1 in the air! 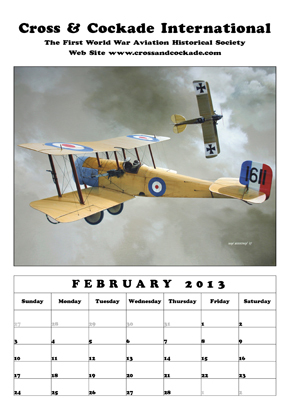 The Royal Air Force Museum has a huge collection of WW1 aviation photographs. Unfortunately, many of these are uncaptioned - and sadly many also have no acquisition details - the museum don't know who donated the albums, or when.